← Was the “Considerable Period” or the “Measured Pace” More At Fault? Next Thursday March 25 the House Financial Services Committee will hold a hearing on how the Fed should exit from its quantitative easing. This past week I was in Japan discussing the Japanese experience with QE with traders and experts in the financial sector and in the Bank of Japan. A simple graphical comparison between QE at the Fed and at the BOJ puts the exit strategy in a useful perspective. 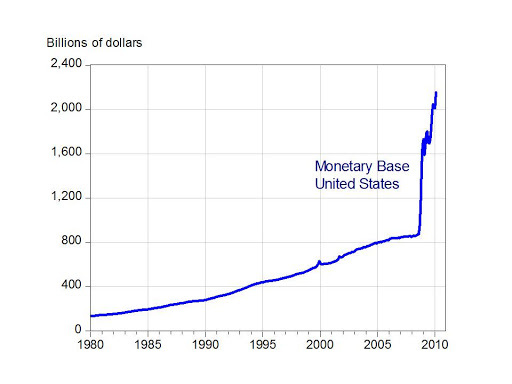 The two graphs show the monetary base—currency plus bank reserves—in the United States and Japan as reported by the Fed and the Bank of Japan. (The BOJ reports units of 100 million yen; thus the monetary base in Japan is now slightly below 1,000,000 units of 100 million yen or 100 trillion yen). The big bulges in the monetary base are measures of quantitative easing because the monetary base would have continued to grow at relatively steady pace without QE. 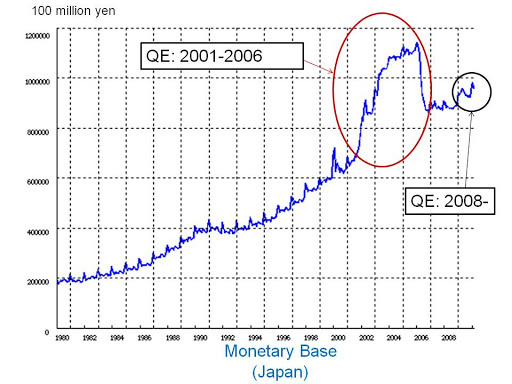 Japan’s experience with QE was from 2001 to 2006; during those years the monetary base increased from about 65 trillion yen to 110 trillion yen, or by about 70 percent. While QE lasted for a long time it ended very quickly, and the quick exit seemed to go smoothly without volatility in the markets. Note that the post 2008 quantitative easing in Japan is very small compared to 2001-2006; thus Japan does not have an exit problem right now though it is still struggling with a deflation problem and will likely continue with its QE. Unlike the Fed, the BOJ did not think a big quantitative easing was appropriate in the recent crisis. First, the monetary base in the United States increased by twice as much in percentage terms (140 percent) compared with Japan. Second, QE came on much quicker in the United States, with most of the increase in the base concentrated in the last few months of 2008, though increases have continued since then. Third, the Fed entered into QE when the interest rate target was 2 percent, while the BOJ started QE when the interest rate was already essentially zero at 0.1 percent. Fourth, the Fed’s quantitative easing has largely been caused by the need to finance its purchase of mortgage backed securities, bailouts of AIG and Bear Stearns and other loans and securities purchases. Fifth, and most important for the exit strategy issue: the BOJ exited from QE much more quickly than the Fed is now signaling its exit will be. Japan’s experience suggests that a quicker exit for the Fed might be considered.